18" (45.5 cm) circumference and 11¾" (30 cm) tall. 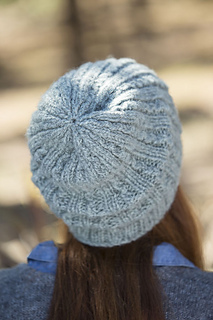 This hat is an easy project for getting acquainted with the textural twisted- or traveling-stitch technique. These stitches have traditionally been used to give pattern and texture to folk knitting and can be found on many examples of long stockings, sock tops, mittens, and gloves. 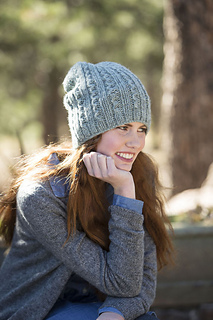 In this project, traditional twisted stitches are combined with rib stitches to give the Annikki Slouchy Hat a distinctively crunchy, nubby texture with enough stretch and positive ease to accommodate most women’s heads. 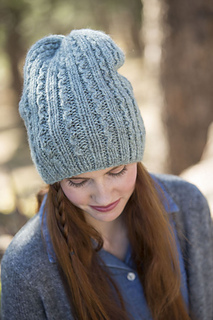 The Annikki Slouchy Hat is knitted in the round from the bottom up and is shaped subtly by gradually reducing the size of the double-pointed needles until the final stitches are decreased and finished with a “rosebud” gather. Size U.S. 9 (5.5 mm) 16” (40 cm) circular (cir). Size U.S. 8 (5 mm) 16” (40 cm) circular (cir). Size U.S. 7 (4.5 mm) 16” (40 cm) circular (cir). Size U.S. 6 (4 mm) 16” (40 cm) circular (cir). Set of 5 size U.S. 4 (3.5 mm) double-pointed (dpn).